Welcome Home Party for One was part of the group exhibition On Demand, curated by the Centre of Attention (Pierre Coinde and Gary O’Dwyer), London. The idea behind On Demand was that – much like a pizza delivery service – the public could select the work they wanted to see, and email or call the curators, who would bring it to their home or workplace for them to view and experience. Ashery scripted a party for one, whereby Coinde and O’Dwyer went to the participant’s house, put up a ‘Welcome Home’ sign, arranged humble Middle Eastern and English refreshments and put on music. Coinde and O’Dwyer, together with the participant, then proceeded to read Ashery’s script, which alluded to the participant’s unexplained disappearance and apparent return home. The fictional ‘Welcome Home’ party celebrated this return. The piece was intended to generate feelings of displacement in one’s own home and to evoke thoughts around notions of disappearance. 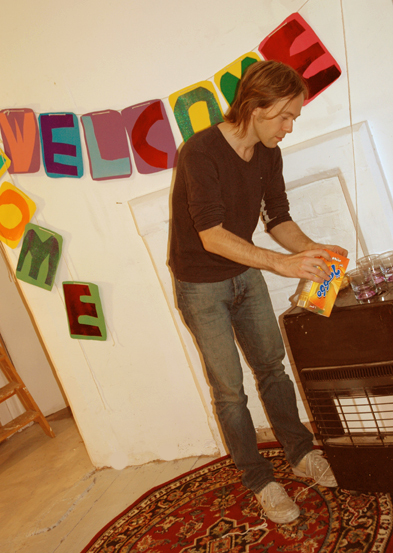 On Demand/Welcome Home Party for One took place in 2005. The other artists who participated in the exhibition were Guerrilla Girls, Ben Morieson, Eileen Perrier and Markus Vater. Photographs by the House of O’Dwyer.